Torey is a typical middleclass high school student in Steepleton, a typical middleclass smalltown in Egg Harbor Township. He's an athlete, the guitarist in a highschool-band, the boyfriend of the prettiest girl in town, a popular kid. He's perfectly normal. Christopher Creed is the school's weirdo. He has no friends and plenty of classmates who have been picking on him throughout his entire schoolcareer. One day he disappears, leaving behind an mysterious letter to his principal and a chaos of rumours and suspicions. Did he run away? Commit suicide? Or get murdered? As the town searches for somebody to blame, Torey, who hasn't had more to do with Christopher than anybody else in his school, starts to question the world he grew up in. Together with two unlikely allies, punk-girl Ali and the "boon", juvenile delinquent Bo Richardson, he goes on a quest to find Christopher, dead or alive. On the way, his life starts to unravel in front of his eyes, as he discovers the lies, intolerance and hypocrisy of his friends and neighbors. "The Body of Christopher Creed" by Carol Plum-Ucci is a stunning novel about finding yourself and breaking your egg's shell. It portrays scarily accurate the microcosms "high school" and "smalltown". The Author manages to make the plot complicated and numerous turns just as believable as her characters, only the last chapter has a very surprising ending that is unbelievable and maybe a bit over the top. Plum-Ucci manages to amazingly get a grasp on many very delicate topics such as intolerance, criminal injustice, smalltown lies, prejudices, overprotective parents, high school cliques, religion and truth in relatively short novel. Be warned: This is one of those books that make you get bad grades because you just can't bring yourself to put it down in order to homework. And it's also the kind of book that will stay on your mind, long after you finished it. Most teenagers will probably be able to relate to this book and recognize a lot of people from school, their neighborhood and maybe even themselves. The fact that it takes place just one county away from Cape May makes it even more interesting, since somebody in say California has no way of ever understanding the magic of hanging out at WAWA on a Saturday night (which happens frequently in this novel). So support a local author and read this book! Have you ever read the Confessions of Georgia Nicholson series by Louise Rennison? Anywho, they've made the first two into a movie called Angus, Thongs, and Perfect Snogging. The bad side? The movie isn't coming out in the United States anytime soon. 7. Startled By His Furry Shorts! Click here for "Next Good Book"
So what is Next Good Book you ask? 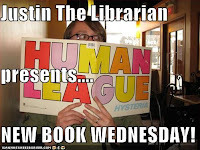 It's a new service offered by the library where you can check out any books and see what to read next plus make comments on the book for everyone to see. 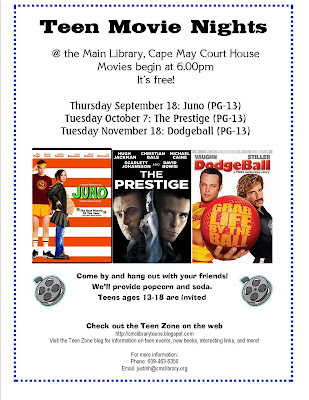 Teen Movie Nights are here! What teen programs do you want to see at the library? My musical taste tends to run into many genres. I have to say that I listen to a little bit of everything. So when I find a band that I just can’t stop listening to, there is something to be said. Silversun Pickups is one of those bands. Carnavas is the latest album from this west coast band. It is a blend highly melodic sounds, distorted backgrounds and fuzzed-out bass. They’re most notable song to date is “Lazy Eye” which frequented MTV several months ago, but the song is only the tip of the iceberg. Other audio-delights include, “Well thought out Twinkles” and “Melatonin,” as well as my personal favorite, “Dream at Tempo 119.” This indie-L.A. band is a throw-back to the alternative rock of the 90’s, and is definitely worth listening too. 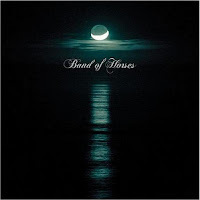 Another band that has caught my short-attention span is Band of Horses with their latest album, Cease to Begin. They are most recognized for “A Ghost in my House” which frequents the airwaves of Sirus’ Alt-Nation. They are a rock band that exudes Southern sound. As well as the Silversun Pickups, this band has become part of the beloved, and highly selective, rotation in my iPod. The music is stunning and layered and the vocals are melancholic and haunting. They remind me of the scene in Forrest Gump, when Tom Hanks is running across the country with Jackson Browne's "Running on Empty” blaring in the background. This is the type of music you can get lost in. 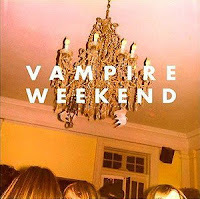 Finally, I have to recommend the impressive self-titled debut album from Vampire Weekend. This is not your everyday punk band. First of all, they style evokes nostalgia about preppy 80’s movies. Think Pretty in Pink. All the songs are upbeat, and include a variety of instruments, including the use of African drums and the forgotten musical art-form of the keyboard. (A huge invention that plagued the entire decade of the 80’s.) This album is album is fun and entirely refreshing to hear against a lot of the manufactured music plaguing airwaves today. It is the perfect summer album. 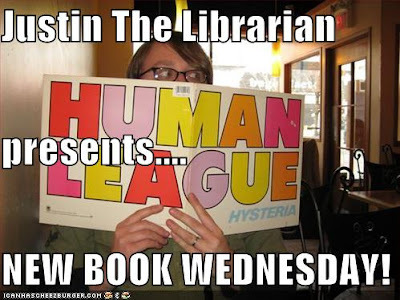 Many thanks to Melissa The Librarian for all of today's music reviews. Here's a sample video I made with some photos and music selected by Animoto. Want to help me out? Use Animoto to make a commercial for the library! Every word in this picture is from one page of the book "Twilight" by Stephenie Meyer. Be the first person to reply to this post with the correct page number. A free copy of Stephenie Meyer's new book "Breaking Dawn"
WE HAVE A WINNER! THIS CONTEST IS CLOSED, BUT PLEASE KEEP CHECKING BACK FOR MORE! This is the first of an ongoing series of Teen Trivia contests. Keep checking this site for more! Plus, feel free to talk about your favorite books, music, etc on our message board. Starting on July 30, 2008, Teen Yoga at the library gives teens the opportunity to attend a Beginners Yoga Class where they will be taught the basics of yoga and they have the opportunity to learn the significance of the various postures as well as have fun and stay fit. Sign up is required and space is limited to 15 participants. 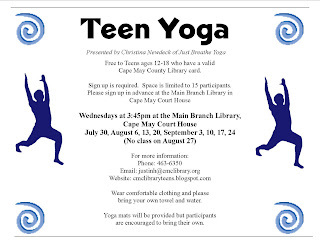 Please sign up in advance at the Main Branch Library in Cape May Court House. Yoga mats will be provided but participants are encouraged to bring their own. Teen Yoga is presented by certified Kripalu Yoga Instructor Christina Newdeck of Just Breathe Yoga, a year round resident of this county and one time student of Middle Township's School District. This is Christina's second program she is offering through the library and is excited to share what she knows of yoga with our local teens. Leave it on a park bench, at a coffee shop, at a hotel on vacation. Share it with a friend or tuck it onto a bookshelf at the gym -- anywhere it might find a new reader! What happens next is up to fate, and we never know where our books might travel next. Track the book's journey around the world as it is passed on from person to person. Join hundreds of thousands of active BookCrossers daily in our many forums to discuss your favorite authors, characters and books in every genre throughout history right up through current releases. Help make the whole world a library and share the joy of literacy. Reading becomes an adventure when you BookCross! 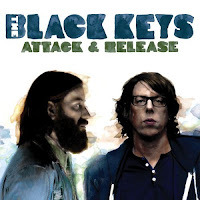 Music Review: The Black Keys "Attack and Release"
Smooth and rhythmic are two words to describe the two man band the “Black Keys” featuring Dan Auerbach on guitar and Patrick Carney on drums. Hailing from Akron, Ohio the Black Keys are known for recording in unconventional places, like a half-finished basement, or on an empty rubber factory floor. Recording in this way adds a very unique sound to their albums all on its own, but when you add the guitar sound that is eerily close to a Hendrix riff, drumming that could almost match Rush’s Neil Peart, and lyrics that are soulful and rousing, you have the making of a great alternative blues band. To date the Black Keys have put out six albums; The Big Come Up, Thickfreakness, Chulahoma –the Songs of Junior Kimbrough, Rubber Factory, Magic Potion, and most recently Attack and Release. All their albums so far have been under the radar hits filled with music that just wants to make you get up and jam out on some wicked air guitar. So what about their latest album? How will it stand up to their five previous albums? Is it one step forward for their music or two steps back, and what is the sound of one hand clapping? All but one of these questions will be answered in my review of Attack and Release. The Black Key’s latest album Attack and Release came out on April, 1st 2008. Wholly unique from their recent albums, Attack and Release was recorded in an actual studio, in collaboration with producer Danger Mouse, also known as Brian Burton. Danger Mouse adds an additional element never heard before in any Black Key’s album so far, the use of additional musical instruments such as jazz flute (which makes me think of Jethro Tull’s Cross Eyed Mary), the piano, and the organ. Attack and Release as a whole album goes up and down with its beats and lyrics, like bipolar disorder never staying too upbeat or downtrodden for long, with precious little time to stay anywhere in between. The album starts off beautifully with All You Ever Wanted. A very melancholic beginning, with soulful undertones, starts this track, with lyrics that flow extremely well to the beat of the music (though I have yet to make any sense of them). Three quarters of the way through the song the organs start blasting, changing it to a southern church revival feel. The band then starts a rock session with their more upbeat songs I Got Mine and Strange Times. Overall, Attack and Release is a remarkable album, but it does drone on a bit after Remember When (Side B). Though different from their other albums Attack and Release just does not have as many memorable tracks as some of their other albums do, but change is hard and they have put some excellent effort in trying to evolve their music. What's new is the Game Night Central blog that the guys in charge of game night have created. Want to know how the latest Super Smash Brothers Brawl tournament went down? Want to hear about any upcoming video game events? Head over to the Game Night Central blog for more information. In other video game news, check out our new selection of video game strategy guides in our Teen Zone room. They're located at the end of the teen fiction and yes, you can check them out! "VirtualNES.com is the largest vNES website on the Internet. vNES is a Nintendo Entertainment System emulator programmed in Java."